American Zombie: Nagin Trial - dados cargados? Nagin Trial - dados cargados? 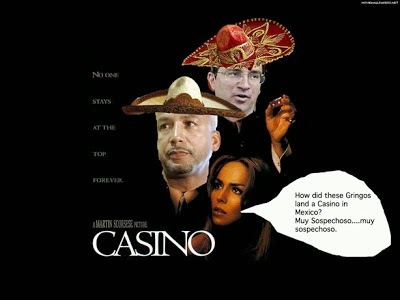 Funny thing happened yesterday, Nagin's partial ownership in a Mexican Casino was confirmed in testimony. He was, indeed, a partial owner in a Mexican casino with his business partner David White. The info I got from my source was that John Georges had ownership in a lucrative Mexican casino deal and that he had cut Ray Nagin and David White in on it as a "political favor". I was told the money from the casino was being funneled through an offshore company domiciled in the Isle of Man and then transferred into Winvestco. I wasn't sure about Georges' involvement at first but then a story from the Miami Herald (still trying to find the link to that story) mentioned Georges' business partnership with this really shady character, Juan Jose Rojas-Cardona, who had created somewhat of a cottage casino industry in Mexico. Not all foreigners have had bad experiences with the Rojas-Cardonas. Some earlier Louisiana investors, including John Georges, a Greek-American marine services and arcade tycoon, apparently did well. Georges, who lost a bid for Louisiana governor in 2007, did not respond to repeated requests for comment. So we have that much established. Although, it's still not apparent if there is a direct link between Georges' Mexico casino interests and Nagin's Mexico casino interests. I kept watching, very closely, to see if there was any mention of Winvestco and...sho' nuff...exhibit 199 was a check written to Seletha Nagin from Winvestco, Llc for $7500.00. I have no idea if this was a one time payment, an annual payment, a quarterly payment, a monthly payment....I don't know...but one thing is clear....it is a payment from Winvestco. I know these are all disparate pieces of a puzzle that haven't exactly been put together but so far everything is adding up...it looks like the pieces fit. Now that Mr. Georges is a newspaper man and supports journalism, I would hope an MSM journalist could ask him about the nature of this Mexican casino biz and if he in any way involved himself with Ray Nagin in respect to it. I would assume that John has a commitment to the truth, considering he now owns The Advocate, and I would really like to hear from him on this issue. There are a lot of people that "bribed" Ray Nagin for political favors, according to the prosecution in this case. With that in mind, I would like to understand the nature of Nagin and White's interests in this casino issue. Maybe there's no connection at all with Nagin/White and Georges...but I think the public deserves an answer from Mr. Georges, a man who holds a position of such esteem and trust in our community. I also think we need to know why George Solomon hasn't been charged with bribery in this case. The prosecution has made it very clear that they believe Solomon bribed Ray by contracting a private jet for $23,520 ( Exhibit 133) to fly him and his family to New York City for a vacation. The prosecution argued there was a clear quid pro quo with Solomon in respect to his "Grand of the East" property. If Solomon bribed Nagin, why hasn't Solomon been indicted? Right now, private businessman Mark St. Pierre is serving a 17 1/2 year sentence. How do you explain that to Mr. St. Pierre? This trial is raising as many questions for me as it is answering them. I think these issues need to be vetted by our MSM journalists....I hope we get some answers. I know the subjects of interest won't speak with me so I'm hoping our MSM heavyweights can find the truth. I don`t know if I was reading this blog in May, 2008. I had other things on my mind. It was a big month for me. I caught up with you-- may even have found out about you for the first time-- sometime later. What you`ve written over the years has often completely shocked me, and given me information, even at a rumor grade level, I needed to have. I am sure many others can say the same. The work done by you and by some other reporters and bloggers will probably touch on more aspects of the corrupted political landscape than any court case ever will. Reading your blog, I came to see the truth of the old point made by some writers that the purpose of the WAR ON DRUGS is not to stop the drug trade, but to control it. I suspect that despite the honor and zeal of many police and investigators, and the personal and political desire of many system insiders to do the right thing, the courts will be used by some for damage control and limiting the scope of public awareness of certain rackets, not for bringing all the patterns of entrenched corruption to light in an ongoing rolling boil of flowing righteousness. Control, not eradication, of lucrative areas of corruption is probably an aspect of what will show up in open court, and what will not. Since the 1980s, some American writers have been talking about Miami and parts of LA and some other places in the USA as having characteristics of such a state, but on the whole, we have all been relieved that America is better than that, the social and political institutions more robust and uncorrupted. There are many, many honorable people in all walks of American public life, across all party lines. The citizens who truly make use of their First Amendment rights and responsibilities are perhaps the strongest line of defence the USA has. But this Mexican casino, and some of the other stories you have written about here, make me think about the ways greater and greater swathes of the USA seem to be too closely connected to the scarier and less functioning mode of political life South of the Border. I think I am very naive, and I am only starting to notice things that other, smarter people have known for years, and know with greater insight and awareness than I ever will. The Katrina cars, will we ever learn what happened there? The ones that you think made it out into a resale market through that Churchwell guy from Memphis, a land route, that`s one set of them. But they were also found all over South America. I`ve always wondered if some of them went out through the Port, and if so, how? How were they not spotted? Did the set of systemic blind spots that let them get out also let other things get in? Who knows? Do we want to know? Maybe not. We`ll never know, and while it is interesting, it is not so interesting that I`d want someone to stick their neck out finding out. Just don`t do drugs, try to avoid troubles I can see are troubles from a mile away, is what I figure I can manage. I just try to handle these choices personally. The Women`s Christian Temperance Movements and their prohibition push was great for the Mob of their day, so advocating for a systemic absolutism and purity often backfires, but to try to have personal behavior that is as responsible as possible and as decent as you can manage on a small scale personal level can help. These corruption cases dance all around the `cocaine standard` aspect of the current financial world. I suspect that a personal decision just not to do drugs because they are bad for the political health of the cities and nations I hold in high esteem is the best I can do.